‘Rack It Up’ is back! 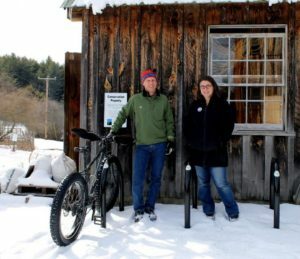 CHESHIRE COUNTY, NH (February 22, 2017) – In an effort to encourage more bicycling in the region, the Monadnock Alliance for Sustainable Transportation (MAST) and Southwest Region Planning Commission seek businesses and organizations in Jaffrey, Walpole, Winchester, and Harrisville to participate in Rack it Up!, a community-based bike rack initiative. The goal of “Rack It Up!” is to encourage bicycling as a healthy, fun and convenient transportation option for residents throughout the region. In order to further this goal, the program aims to increase both the number and visibility of bike racks in participating communities. As a result of past Rack it Up! efforts, 438 new bicycle parking spaces are available at various locations in Keene, Swanzey, Hinsdale, and Troy. The program is supported by the CDC’s Partnerships to Improve Community Health initiative and administered by Healthy Monadnock. Stonewall Farm in Keene, NH received bike racks through Rack It Up! in 2015. To apply, go to www.mastnh.org/rackitup, or contact Liz Kelly at (603) 357-0557 or lkelly@swrpc.org for more information. Increase access to and quality of healthcare. To learn more about Healthy Monadnock, visit the website at www.healthymonadnock.org.